The Beagle is a breed of small to medium-sized dog. The most accepted explanation of the name relates it to the Celtic word ‘beag,’ meaning small. Rabbit is the chief quarry for Beagles used for hunting. A member of the hound group, it is similar in appearance to the foxhound, but smaller with shorter legs and longer, softer ears. Beagles are scent hounds, developed primarily for tracking hare, rabbit, deer, and other small game. 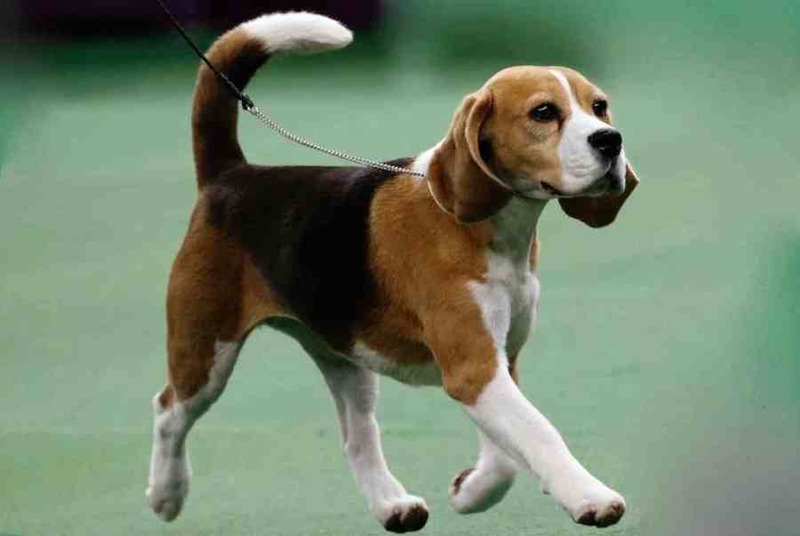 Though the earliest references to Beagles were in 15th-century writings, there are those who believe this breed harks back to 400 BC when similar small hounds were used for hunting by the ancient Greeks. Beagles are thought to have descended from dogs brought from France at the time of the Norman Conquest in 1066. 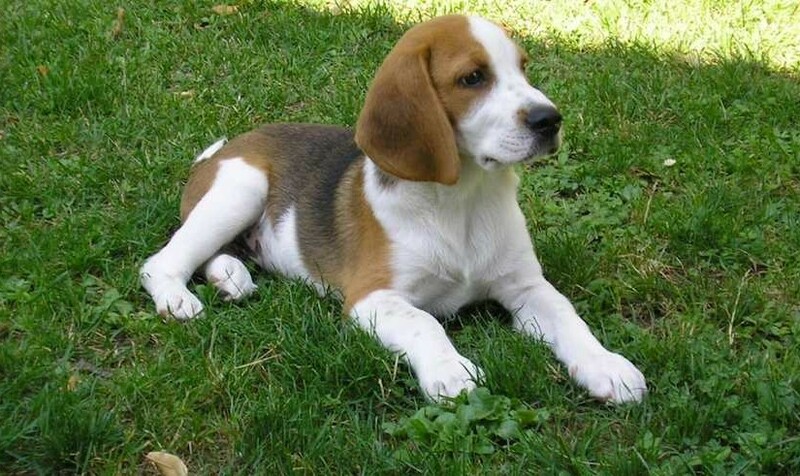 General Appearance: Beagle is like a miniature Foxhound, solid and big for his inches, with the wear-and-tear look of the hound that can last in the chase and follow his quarry to the death. Size: There are two varieties: 13 inches (33 cm) Beagle – for hounds not exceeding 13 inches in height; and 15 inches (38 cm) Beagle – for hounds over 13 inches but not exceeding 15 inches in height. Coat and Colour: A close, hard, hound coat of medium length. Any true hound colour. Head: The skull should be fairly long, slightly domed at occiput, with cranium broad and full. Muzzle of medium length – straight and square-cut, the stop moderately defined. Nostrils large and open. Jaws level. Lips free from flews. Eyes large, set well apart – soft and hound-like – expression gentle and pleading; of a brown or hazel colour. Ears set on moderately low, long, reaching when drawn out nearly, if not quite, to the end of the nose; fine in texture, fairly broad – with almost entire absence of erectile power – setting close to the head, with the forward edge slightly in-turning to the cheek, rounded at tip. Neck: Neck rising free and light from the shoulders, strong in substance yet not loaded, of medium length. The throat clean and free from folds of skin; a slight wrinkle below the angle of the jaw, however, may be allowable. Forequarters: Shoulders sloping – clean, muscular, not heavy or loaded – conveying the idea of freedom of action with activity and strength. Forelegs straight, with plenty of bone in proportion to size of the hound. Pasterns short and straight. Feet close, round, and firm. Pad full and hard. Body: Back short, muscular, and strong. Chest deep and broad, but not broad enough to interfere with the free play of the shoulders. Loin broad and slightly arched, and the ribs well sprung, giving abundance of lung room. Hindquarters: Hips and thighs strong and well muscled, giving abundance of propelling power. Stifles strong and well let down. Hocks firm, symmetrical, and moderately bent. Feet close and firm. Tail: Set moderately high; carried gaily, but not turned forward over the back; with slight curve; short as compared with size of the hound; with brush. Faults: A short, thin coat, or of a soft quality. A very flat skull, narrow across the top; excess of dome, eyes small, sharp and terrier-like, or prominent and protruding; muzzle long, snipey or cut away decidedly below the eyes, or very short. Roman-nosed, or upturned, giving a dish-faced expression. Ears short, set on high or with a tendency to rise above the point of origin. A thick, short, cloddy neck carried on a line with the top of the shoulders. Throat showing dewlap and folds of skin to a degree termed “throatiness.” Straight, upright shoulders. Out at elbows. Knees knuckled over forward, or bent backward. Forelegs crooked or Dachshund-like. Feet long, open or spreading. Very long or swayed or roached back. Chest disproportionately wide or with lack of depth. Flat, narrow loins. Flat ribs. Cow-hocks or straight hocks. Lack of muscle and propelling power. Open feet. A long tail. Teapot curve or inclined forward from the root. Rat tail with absence of brush. Disqualification: Any Beagle measuring more than 15 inches (38 cm) should be disqualified.